Fishermen commonly use bait to lure a fish into biting their hook. Not all bait is created equal, however, and there are many kinds. When selecting your bait, you should take into consideration many factors, including the type of fish you want to catch, the abundance of certain baits in your local environment and the local laws that determine which baits are safe for which waters in your area. Worms may be one of the most well-known types of bait, and are that way for a reason. Worms are abundant and easy to collect yourself, and therefore inexpensive. You can catch earthworms or night crawlers by digging in the dirt at night using a flashlight. You can obtain manure worms or red wrigglers by looking in pastures and compost bins, according to GoneFishingShop.com. Another reason you may want to use worms is because you can catch a wide variety of fish with a worm on your hook. Earthworms or night crawlers are good for catching walleyes and bass, while manure or red wriggler worms are best for catching sunfish and trout. When fishing with worms, TakeMeFishing.org suggests only putting a small piece of worm on the hook. If the worm is too long, a fish will just nibble part of it off without getting the hook in its mouth. Another bait that is good for catching walleye, and also pike, is leeches. Unlike worms, which you can easily collect, leeches are usually purchased in a bait shop. After you buy leeches, they will keep for many days if refrigerated, according to TakeMeFishing.org. Fish are attracted to the swimming and wriggling motion of leeches in the water, so you should try not to move them faster in the water than they can naturally swim. If you live in an area where clams and mussels are endemic, you can also use them as bait for fishing. You can collect clams and mussels while fishing in shallow waters and crack them open in preparation for fishing. Opening these animals up and setting them out in the sun will make them tougher and help them stay on the hook. Takemefishing.org recommends using thread to tie mussels onto the hook if they are falling off. Minnows, which are live baby fish, are a good bait that is regularly sold in fishing stores. You can also catch minnows yourself using a net, however this is not legal in all waters so check before you try to catch your own. Like leeches, minnows attract larger fish with their natural swimming motions. 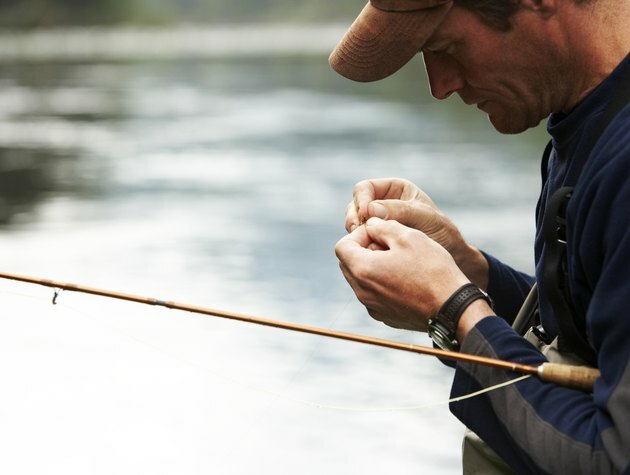 TakeMeFishing.com, therefore, recommends you use care when you put a minnow on a hook to ensure you do not slice through its spinal cord and paralyze it. In addition to using sea creatures for bait, you can also use insects. If you live in a climate where there are many insects, you can even collect your own to save money. Use nets to catch grasshoppers, caterpillars and beetles. Follow a trail of ants to their nest to scoop up a large amount of ants. Sunfish and trout like to bite on hooks baited with ants, beetles, grasshoppers and caterpillars, according to TakeMeFishing.com. Instead of using just one type of animal for bait, you can also use a combination of them in a prepared bait called a dough ball. Dough balls are clumps of specific baits smashed together that you can buy in stores or make yourself. Store-bought dough balls are usually filled with specific animal pieces geared at fishing for a certain type of fish. To make your own dough ball bait, TakeMeFishing.org suggests sticking pieces of your specific fish pieces together using flour, cornmeal, water and molasses.